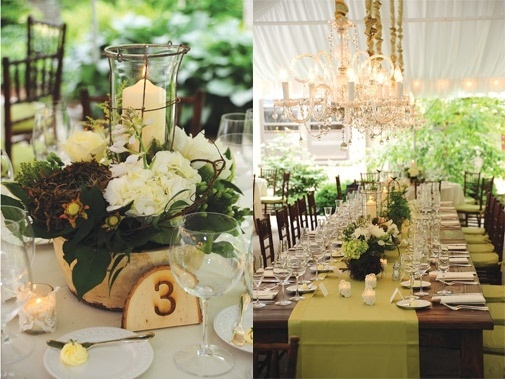 Today we are going to go to our own backyard in search of beautiful wedding inspirations. 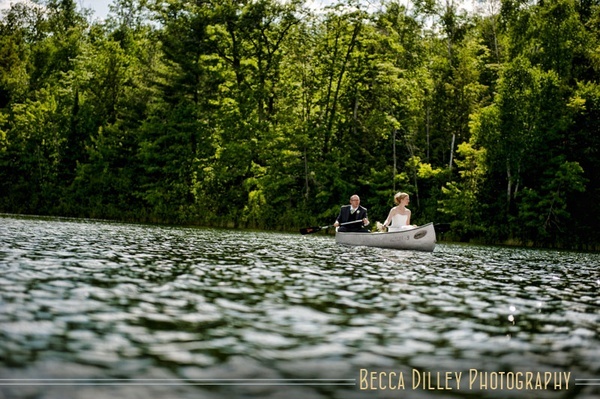 Many don’t realize it, but Wisconsin is the perfect destination wedding spot for those outdoorsy types and just for those who love beautiful views of lakes and landscapes! 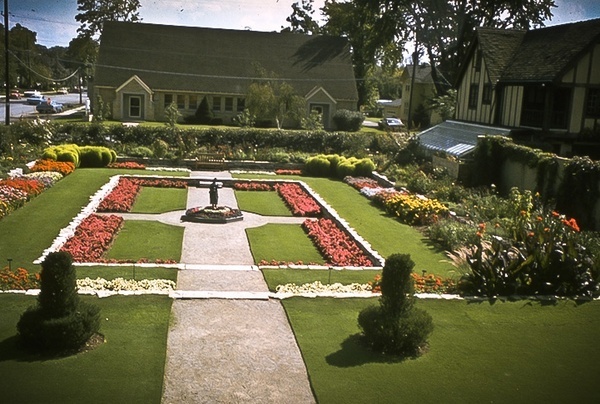 A great place close to the Valley is the Paine Art Center in Oshkosh, WI. It’s so beautiful and the perfect place for any wedding! 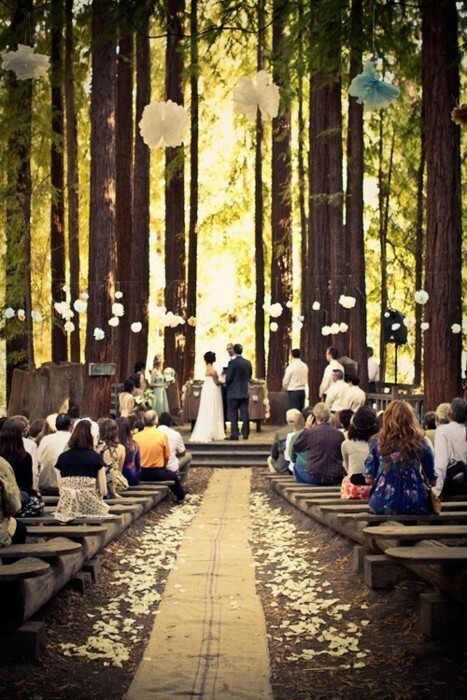 Here is a great example of what could be done for the ceremony aisle. Somewhere with a wooded path this would be so gorgeous and just perfect for the fall season that is creeping up on us! The log benches are awesome as well, this is where it’s good to know someone who’s good with a saw 😉 Another great northwoods ceremony idea could be on a lake front. In this beautiful green pasture with the white flowers scattered across the aisle, it’s so beautiful, simple and elegant. Surely a classic. And even though it may possibly rain somewhere out here in Wisconsin, don’t let it cancel your parade! Have some sort of back up, whether its an over hang for the ceremony and umbrellas for the guests or a cozy barn with cute hay bale seats. And don’t take for granted mother natures decisions. Take it for the great photo opportunity it is! We all know life is not about waiting for the storm to pass but learning to dance in the rain! 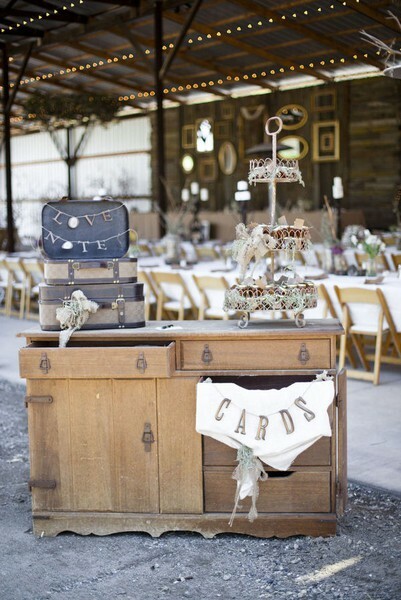 Here’s a great way to decorate for the reception. Outside with a touch of class by hanging the chandeliers and the long cozy tables. I love the wooden table numbers. 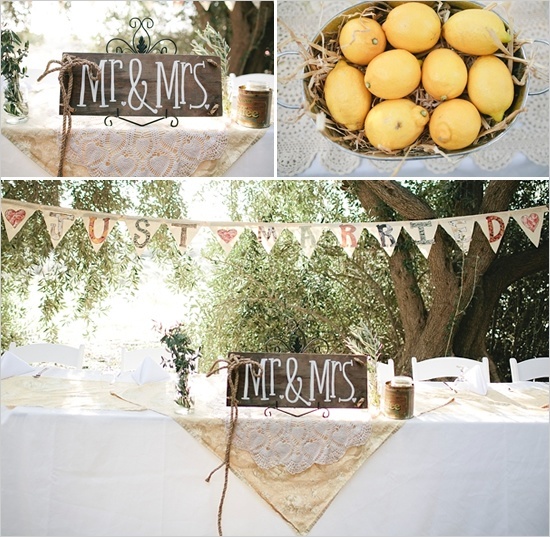 This is another option for decorating tables for the reception. Very outdoorsy but a little more fancy that the last style. It really depends on what look you are going for. I especially love the draping of the crystals here. I really really love this cake! 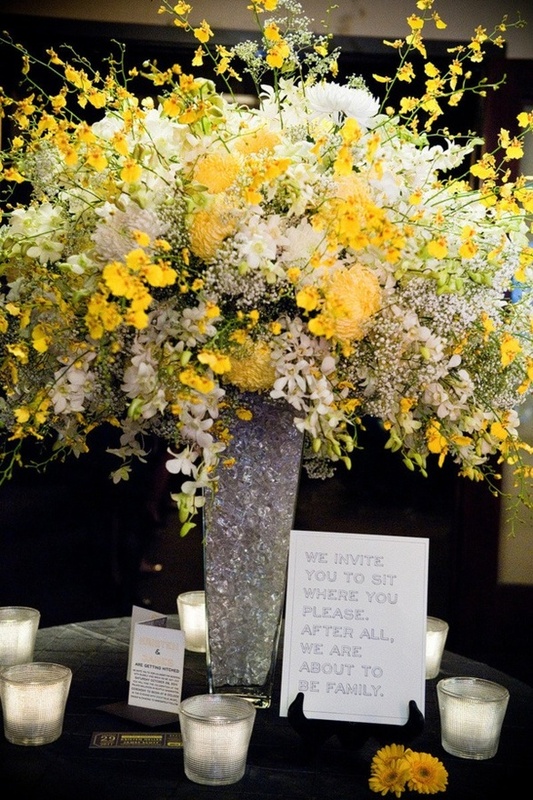 The lines are super simple but the texture creates depth and the flowers are perfect. 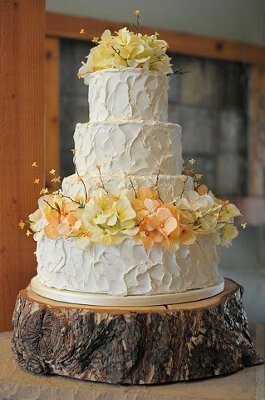 Any outdoor wedding could use a cake like this! So chic! The wooden base is also another great touch, just remember to put some sort of sheet down to protect the cake or use a butcher block sealant to make the wood food safe! 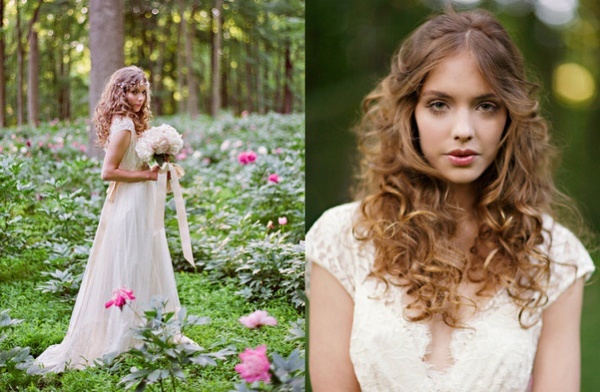 For an outdoor wedding, the bride must keep in mind the weather when she’s having her hair done. This style show below may not hold up well on a particularly windy day but it’s oh so cute! And who said no one loves a little windblown natural look anyway 😛 The addition of flowers in the hair would be perfect for the woodsy wedding too! As well as the hair this dress is perfect for a northwoods wedding, the lace is simple and traditional and the flowing lines of the bottom of the gown are perfect for a warm summer day. This next dress would be a lot heavier than the first but is still awesome for a northwoods fall wedding. If it’s cooler outside it would be perfect to keep you from freezing. Although if its scorching you may pass out Make sure to keep in mind location and weather when picking out yours and the parties dresses and clothing options. You don’t want anyone super uncomfortable. The happier everyone is the less problems that are likely to occur. Meaning less to stress about the day of! This is such a chic way to incorporate the blue into your wedding. 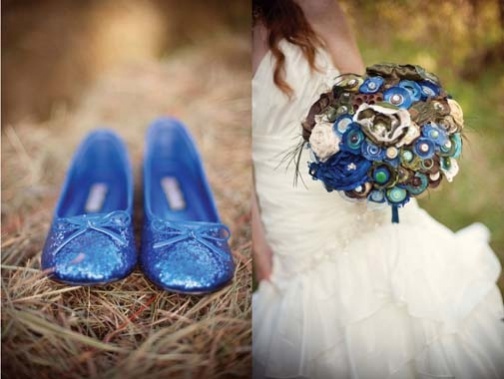 Of course adding it to your shoes has been really popular and this shiny flat option is great, especially if you’re getting married outside in the grass…where heels may create a problem with your stability 😛 And the bouquet, with it’s combination of real flowers to the cloth flowers in bright blue is adorable and just adds the right about of Pop! 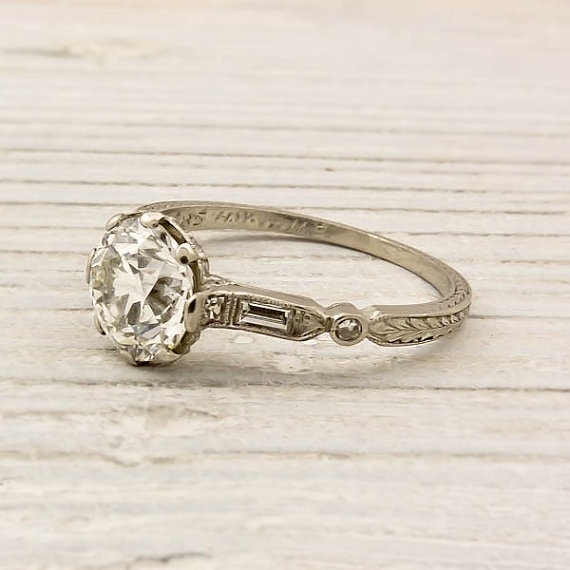 Just for fun here are some gorgeous rings that any Wisconsin bride is sure to love. This one has a really antique feel, as if it were to have been passed on from generation to generation. So classic and beautiful. 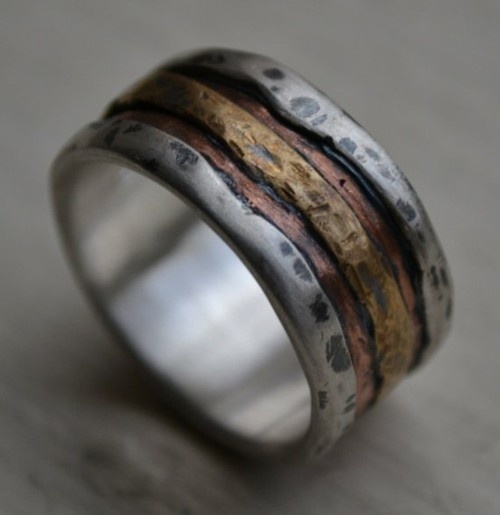 This men’s ring is a lot more modern than the women’s, but still fits with the theme. Not as flashy as some rings and I really think a lot of northwoods grooms would like this. Just because I can, I through this in here! This is a perfect example of why Wisconsin would be an amazing place for anyone outside of the state to consider it as a destination wedding location! 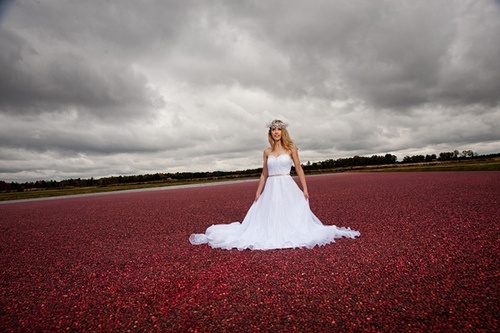 Just look at those fields of cranberries! Gorgeous, although I’m not quite sure how she plans to keep that dress after this, but as far as any trash the dress shoots I’ve seen goes, this one takes the cake! You can’t get shots like this just anywhere 🙂 And I”m sure proud to say good ol’ Wisconsin is one of those places! And as we part, here is a lovely shot of the couple going off to wherever life takes them. Or another option…a grand entrance into their ceremony. Either way, super cute and romantic. 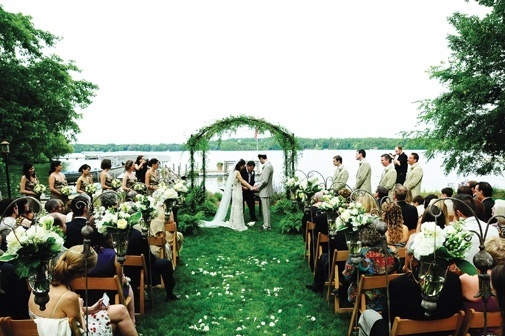 And perfect if you’re having your northwoods wedding on the river or lake front! Hoping all is well on this dreary Wednesday Wisconsin day. So I’ve been searching around, looking for inspiration for blogs, and I’ve come back to something I love. Food! Who doesn’t love food. It’s what sustains us and keeps us (ME) happy! Without food, well…we’d all be skeletons, and that just doesn’t seem fun. So today I thought I’d bring you some creative food ideas for weddings of all kinds. Now depending on how rambunctious you are feeling the week before your wedding will determine if you really want to make these treats by yourself, or hire out all of your family and friends to help! (And by hire, I mean guilt them with your love into helping you create delicious memories!) All joking aside, I’m sure someone out there would love to help! For recipes go to my pinterest, and find these and more Noms under my Sweets and Noms board! 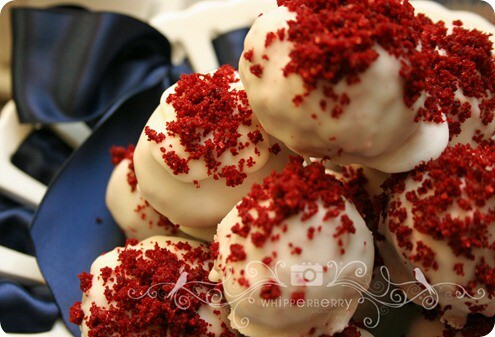 They can also be found on Visuelle Productions Pinterest board, Wedding: Deliciousness! These delicious chocolate bowls would be a great started to have at any candy, fruit or ice cream bar, just make sure it’s a cool summers day so they aren’t melting all over! I really love how these are made with the balloons, so creative! 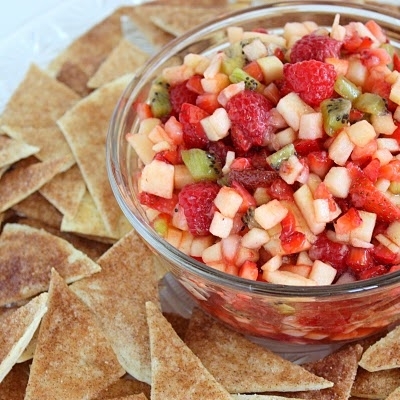 For instance, this fruit salsa would be an amazing addition to your chocolate bowls! Don’t you agree? The cinnamon chips are a nice touch though as well. In a large bowl, thoroughly mix kiwis, apples, raspberries, strawberries, white sugar, brown sugar and fruit preserves. Cover and chill in the refrigerator at least 15 minutes. Super simple and oh, so delicious! 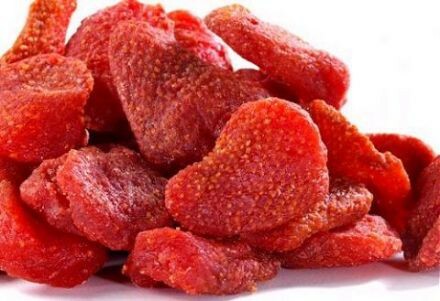 These dehydrated strawberries would be a cute favor for any spring or summer wedding, and are just like candy, they are so addictive! 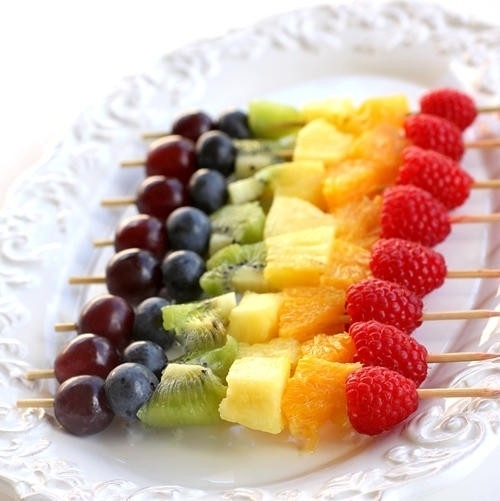 Another thing that could be added to your “fruit bar” would be these simple fruit kabobs. Pretty self explanatory and a super sweet addition to any wedding food bar. These next few items are something any wedding Can’t go without! Cake!! Yumm yum. This cake just has a slight spin on your more traditional wedding cake. 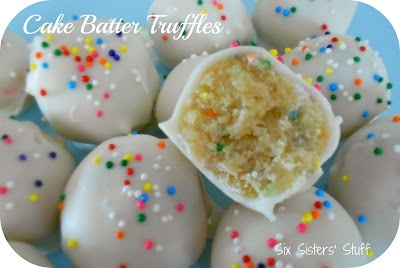 These truffles are actually uncooked, eggless, cake batter balls. The balls are dipped in almond bark and topped with sprinkles. I seriously can not get enough of anything cake batter-y!! These cake balls are actually cooked cake. I love the gorgeous red color of the red velvet, mixed with cream cheese frosting and dipped in chocolate bark (regular or white chocolate). This online recipe calls for a box cake, can of frosting and bark, I’d prefer to make the cake from scratch to really have control over it’s density and texture, but this is the much faster, more simple way. Both, tasty! Keep in mind there are tons of way to decorate cake balls, stick a lollipop stick in them and BAM! Cake pops! A hit at any wedding for sure. For the super energetic bride out there, cupcakes are a delicious way to go, although I wouldn’t suggest you personally make these yourself for your special day, especially for a huge guest list!! They are still a great option for any wedding :)These lemon blueberry cupcakes would be perfect for a spring or summer wedding. 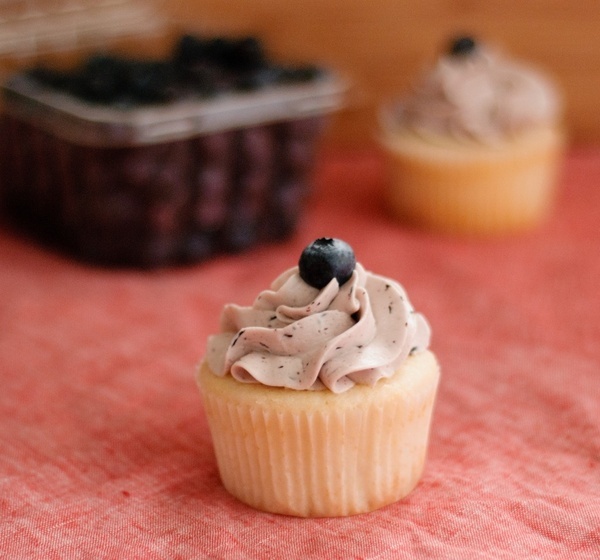 A super light fluffy flavor with the lemon and just the right amount of sweet with the blueberries, you can’t go wrong. 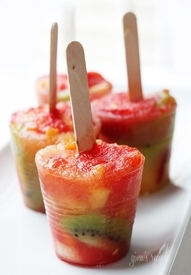 Something I’m sure the child in all of you will love, are these creative and cute popsicle ideas. Pretty easy, but make sure you have enough molds or cups for the amount of hungry guests you have. 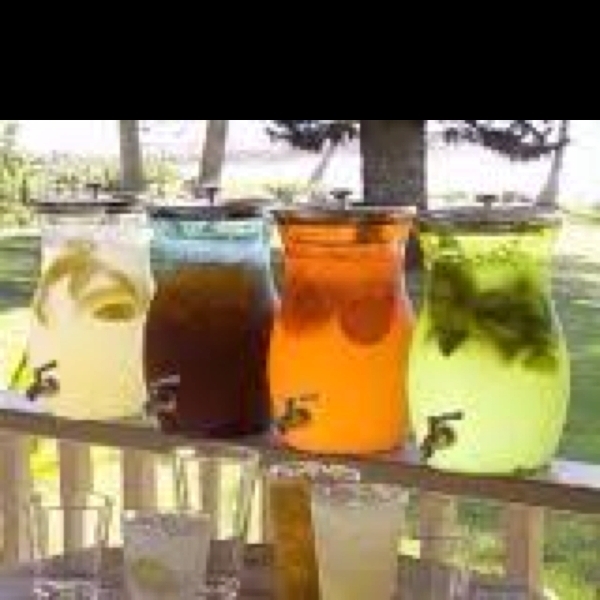 This is the perfect way to cool off on a hot summer’s day during an outdoor wedding. 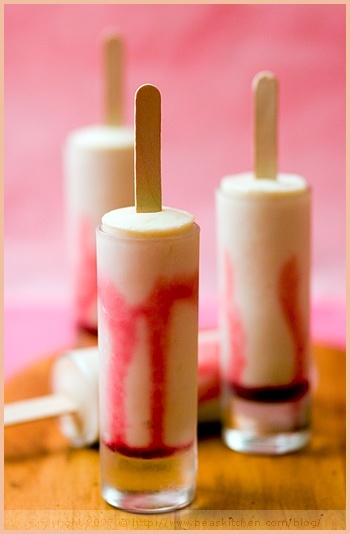 This next one would be for the more health conscious bride because these are frozen yogurt pops with raspberries! 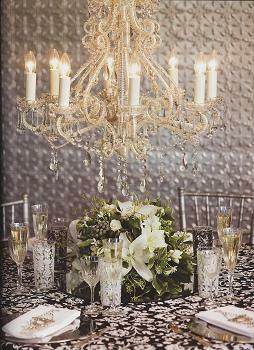 Jess here, offering you another installment of what I find to be beautiful wedding ideas! Side note: Model Your Brand and Visuelle just got back from Florida! There will be pictures up soon to showcase our trip, it was quite the adventure! So this week I’ve decided to bring to you the fashions and ideas that are oh so popular for this summers/spring’s weddings. Got a little Grease going on with the Summer Lovin’! Old style is Hot right now and you will mostly see this in the cuts of dresses. Colours are going to be bright but mixed with pastels and they will speak volumes! 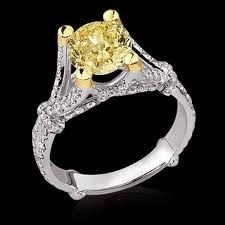 Here is a gorgeous canary diamond ring. I’m sure any bride would be thrilled to receive this huge diamond. Unless you are absolutely against beautiful things! Or are just really traditional…But none the less, a stunning start to the summer lovin’ idea. Now we must dress our bride and here are two different options that are stunning. The first option being a little more simple and classic. 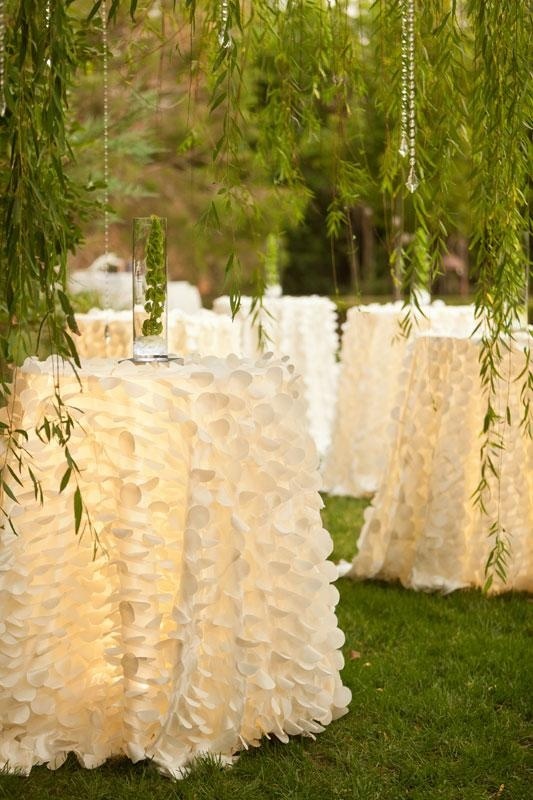 Clean flowing lines that would be great for an outdoor wedding in the middle of summer. Just enough bling to add some interest. 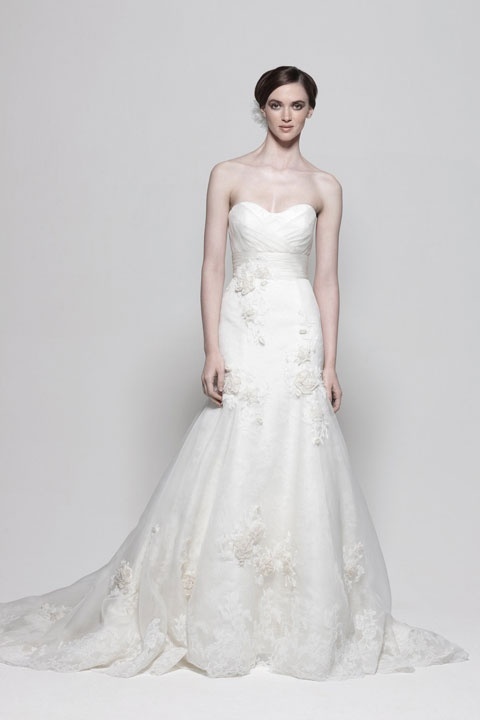 The second is classic as well and a bit more traditional with some flair from the flower buds all over the gown. I love this ivory colour and really think it would go well outdoors for a more natural feel. 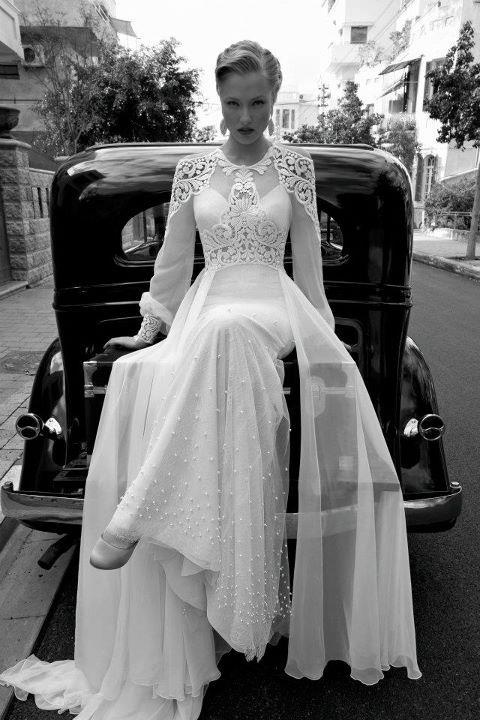 The fit it beautiful as well and would be amazing on so many brides! As for the hair and makeup for the bride, I would really base it on the weather and time frame. If it’s really humid and warm, I’d opt for an updo. It would give you more control over your hair and avoid any frizz! For a calm, beautiful day, flowing hair would be beautiful! If it got way too warm, you could always sweep it up into a loose updo for the reception. 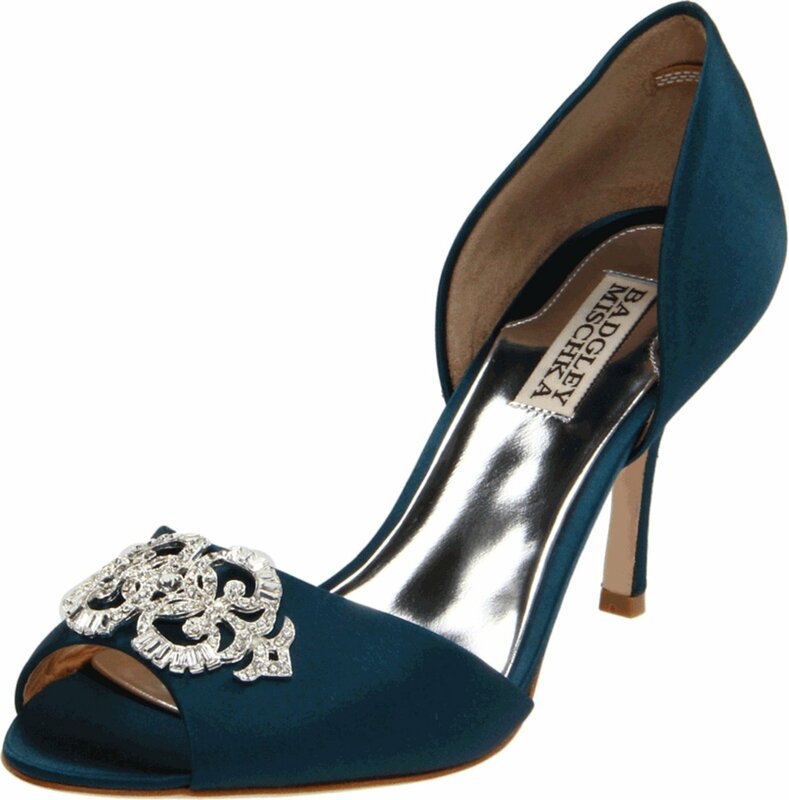 These shoes would be stunning for any wedding, but I love this colour. The extra bling is certainly welcome as well! And not to mention, a pop of colour under the dress has become a huge trend this year and last. Making that colour blue just leaves one more thing checked off your to-do list! Now you need to dress your lovelies that will be helping throughout your big day! Each of these are beautiful and once again, weather permitting you can go short, or longer for a cooler summers day. The tricky thing about planning a summer wedding is cooperating with the weather that you are unsure of. This colour would be amazing to brighten up any dull moments at your wedding. It adds so much fun! Every bride (I’m sure!) is excited to have flowers at her wedding. These are great for summer and bring in beautiful pastels. Against the yellow in the bridesmaid dresses, this would be enough to pop but not over power! 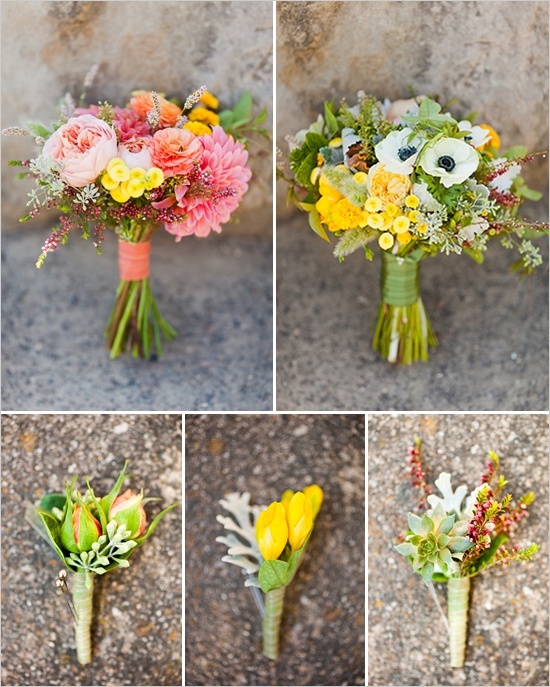 I love the boutonnieres as well, each a little different on the same palette of colours. This centerpiece would go well with any summer wedding and the colours can be easily altered with different flower choices. The yellow is brilliant though! Now that you are full and in need of a thirst quencher, this table of drinks is a cute way to once again add more colour and offer a great variety for your guests. I would recommend putting these in a bed of ice though. Depending on how warm it is, but cold sangria is much more delicious! Another way to cool off your guests would be to offer this dessert. 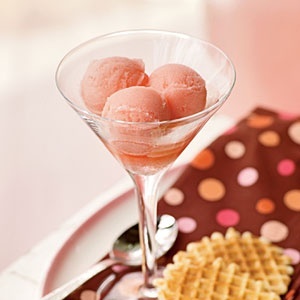 Different sorbets or gelatos make a great alternative for people with allergies or that want a gluten free option. If you make that extra effort for your guests they’ll feel much more comfortable and your evening will be all that much more enjoyable! 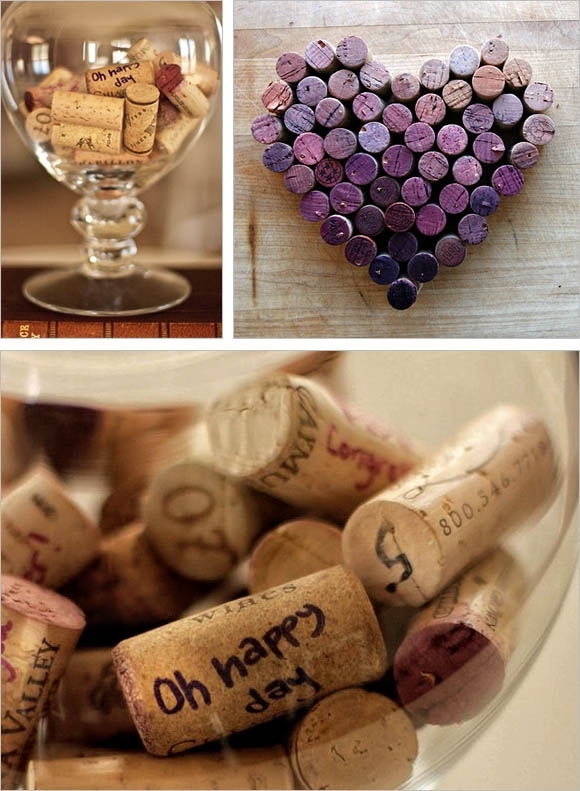 And now, signing out with this cute way to have your guests sign in with these whimsical corks. Although, you’d have to start drinking up right now, or contact your closest restaurant to start collecting those corks! (I’m already preparing for my wedding to come in the next 27 years…get the wine ready!) The beautiful purple from the different wine is awesome as well and very fitting! Hope this was enjoyed by all. We’ve now decided to separate our pinterests. One for Visuelle Productions, one for Model Your Brand and of course my personal. These will still be on my personal, but from now on I will include them in Visuelle’s so make sure to follow both and get the most ideas for your wedding! Happy Monday to all! Jess here, hoping all is well in the land of wedding! I have some great news to start off with, I’m very happy to announce one of Visuelle’s very own models and one of my very good friends, is engaged! 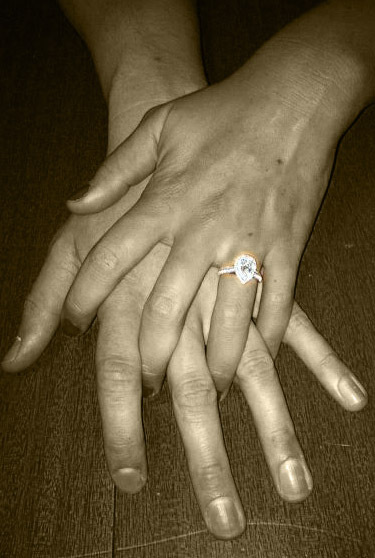 Shout out to Ashley S. on her engagement! I’m super stoked about this personally because she has asked me to stand up in her wedding as her maid of honor, and let me tell you! After working with the wedding industry for a little over a year now, I am so excited to get to put my knowledge to work and help her plan what’s going to be a fabulous wedding! Now you must keep in mind this theme can be very subtle or very very dramatic. You have to keep it classy and colours are a really good way of doing that! Subtle greys with black and white! So glamorous, I can see it now! For sure this must be a black tie event as well! 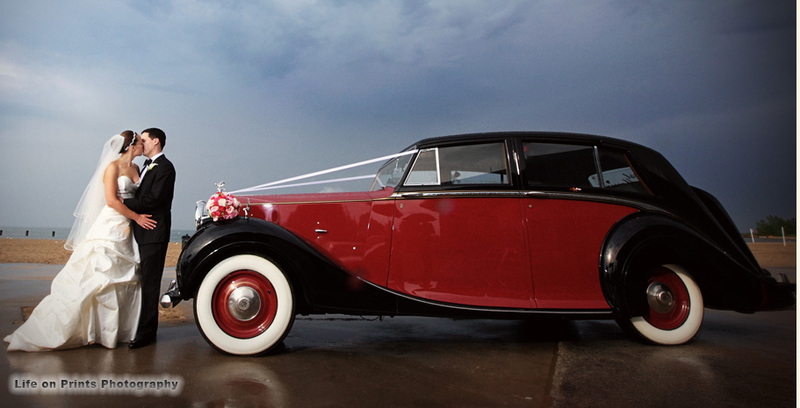 Think Marilyn Monroe..
Now every celebrity (and bride) needs to ride up in style, can you imagine showing up to your wedding in this gorgeous 1948 “Silver Wraith” Rolls Royce? One day, that will be me walking out of this car. I seriously fell in love with the idea the first time I saw this! But wait! In order for anyone to see this spectacular moment, they need to be invited don’t they?? 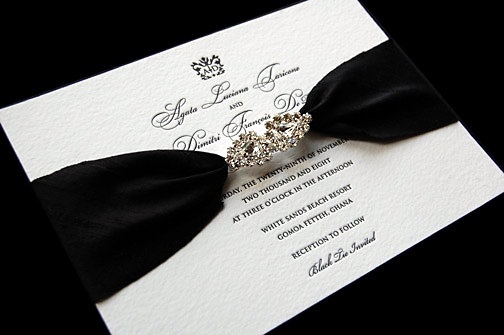 Well this classic invite is sure to catch the attention of your guests in all the right ways! Once I saw this dress I was in love with everything about it for this theme, To bring a touch of modern style as well you could get something similar maybe without sleeves. Love the flowing lines of it! Now I realize some of you are probably like, what on earth is she thinking suggesting those as bridesmaids dresses!!! And I’ll tell you, I’m thinking I’ve been watching a little too much of David Tutera’s My Fair Wedding! That’s what! & I think he’d be proud of me, those dresses are killer! But, for the less dramatic of you out there, here are more stunning options more up the bridesmaids alley, but still super chic and old Hollywood! Now add a bouquet that is sure to stun and bam! A beautiful bride that no one is soon to forget! 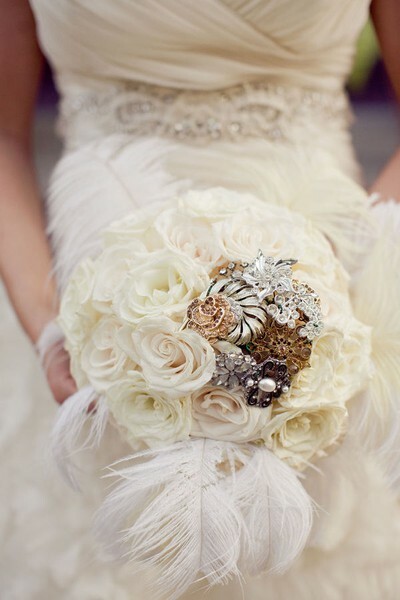 I really love the incorporation of the brooches in this bouquet as well as the feathers! 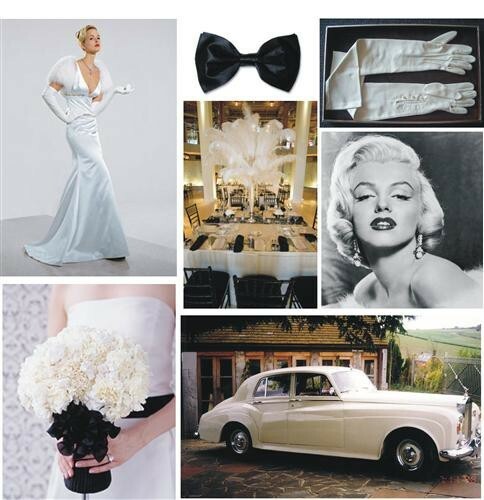 I don’t think you could have a Old Hollywood style wedding without some killer antique brooches and ostrich feathers! 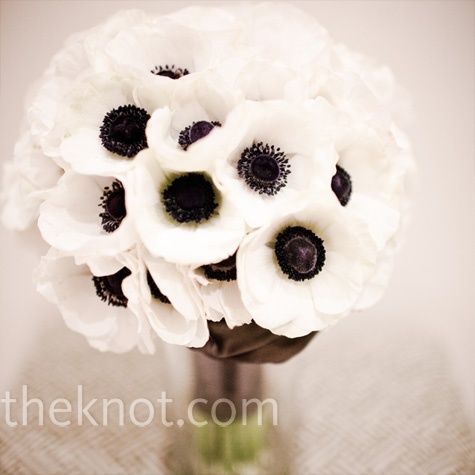 This next bouquet is just stunning with the simplicity of the black and white. These shoes…well. Fabulous and just the right amount of sparkle for the old hollywood bride, they come in a variety of colors, I especially love the blue…one less thing off your bridal check list! Now that our bride (and possibly our bridesmaids) are beautified! It’s off to the reception! 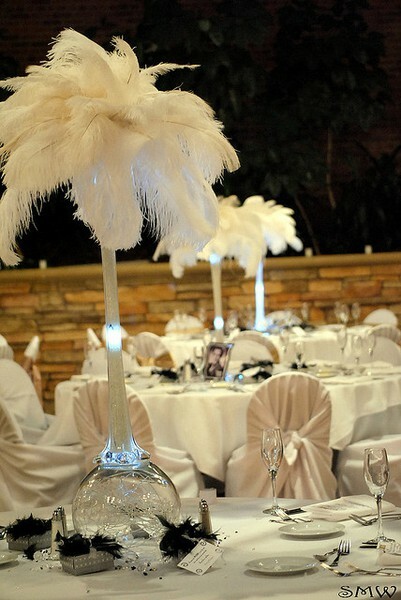 These table decorations are sure to inspire quite the look for your wedding. I don’t think there could ever be too many feathers used, but I suppose I could be proven wrong! I’ll just have to leave that to the pros! And another look just for fun…The table cloth in this one is divine! Now the yummiest part of the night! The cake! 🙂 If you are not aware, I plan to start going to school for culinary arts in the fall, and the cakes are probably one of my most favorite aspects of any wedding! They double as a stunning focal point and a delicious dessert! Nothing better than that, I say! 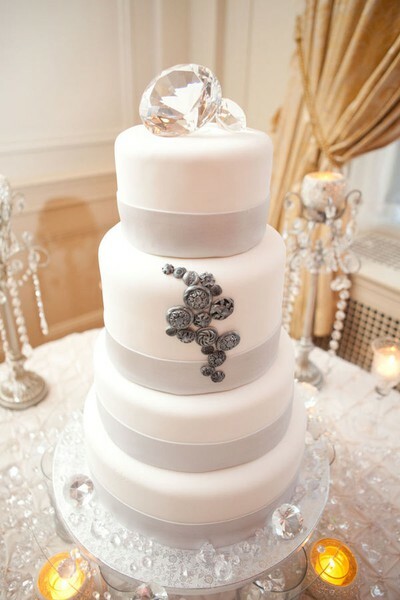 This particular cake is so modern but the simpleness of it is truly timeless! The giant gems on top are beautiful as well. Lastly I’m going to leave you with a cute inspiration board I found, I really enjoy the bow tie and think the men should all be wearing these! Really c0mpletes the look! Hope you enjoyed another installment of my vision of stunning wedding themes! Find these images and more on my pinterest. Along with all of the credit information! Diamond Jewelry Up for grabs? 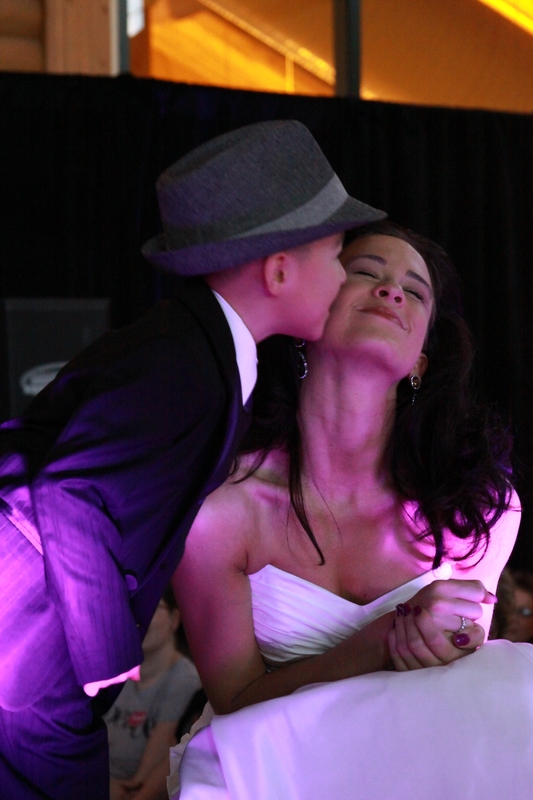 Only at Visuelle Productions March bridal show! Hey Brides! Visuelle Productions Spring Wedding Spectacular is coming soon! Before you know it, we’ll be over with St. Patricks day and on to the show! We’re hosting 65 of the area’s top wedding vendors who are ready to dazzle you with everything new and exciting for your special day. Meet with these fine companies face to face, see, feel and taste their products (lots and lots of cake, people!) Spend the day and let them help you make your wedding plans a breeze. There will be spectacular display’s of cakes, gowns, DJ’s, photographers, floral arrangements, invitations, romantic honeymoon destinations, and more for you to choose from. 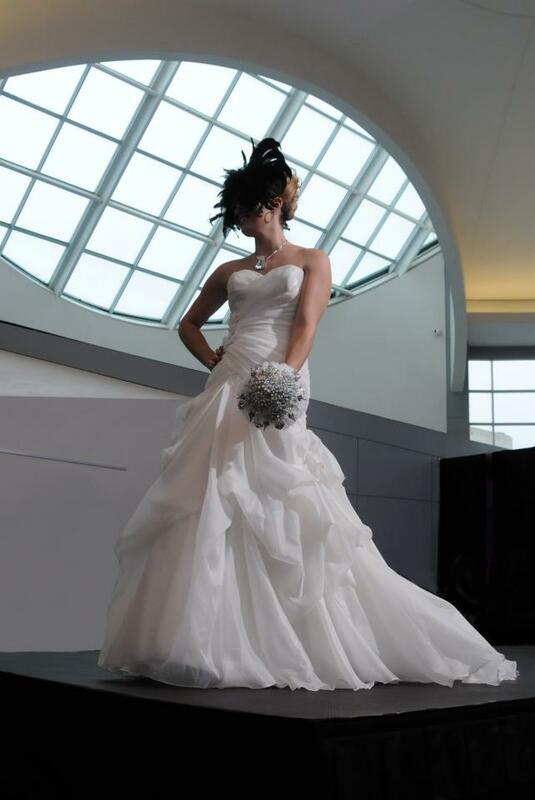 Enjoy the professionally produced Fashion Shows at 11:30 am and 2:30pm featuring 5 area bridal salons. Special entertainment prior to the fashion shows and throughout the day. Between the fashion shows the bridal salons will be available to let you view or even try on a gown that was in the show and caught your eye. The GRAND PRIZE is a magnificent LeVian Chocolate Diamond Pendant Necklace, valued at over $5,000.00 from A&E Jewelers. A complementary one year subscription to Bride Magazine is included in the show admission, simply by signing in. The first 200 brides will receive a matching wedding band set valued at over $600.00. Every bride will receive a gift bag full of fabulous treasures. Tickets available only at the Fox Cities Performing Arts Center ticket office, bring your groom for FREE. While at the show, text: Visuelle to 55678 to register with Visuelle Productions to receive a fabulous treat! Hope to see you all there, this is an event you wouldn’t want to miss so pack your cars full of loved ones and come spend the day with us! Hey Brides!! This wedding show is one you can’t miss! Hello to all of our lovely wedding bloggers! Just thought I’d get the word out again! Visuelle Productions is kicking off their first show of the year at Tundra Lodge and it’s one you won’t want to miss! 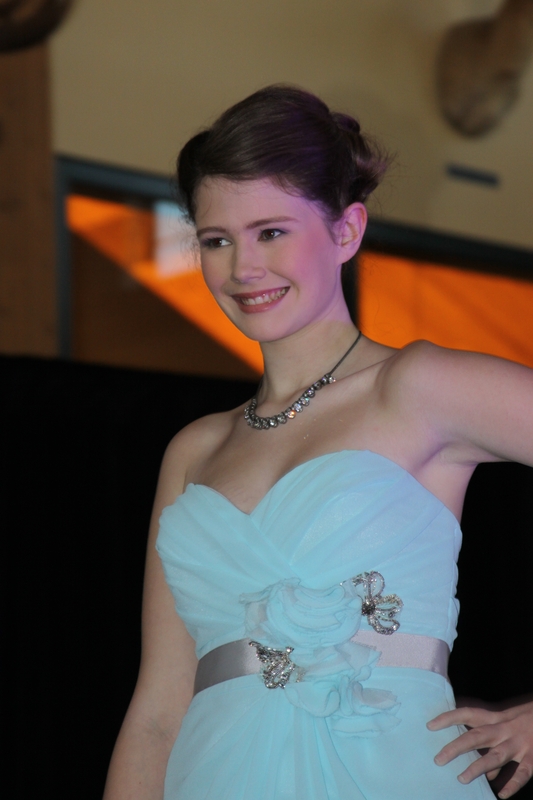 And come to see our models who have traveled far and wide to bring to you this spectacular event! Visuelle Productions Wisconsin Wedding Spectacular at the exciting Tundra Lodge featuring two floors with 100 vendors to dazzle you with new and exciting things for your Special Day. 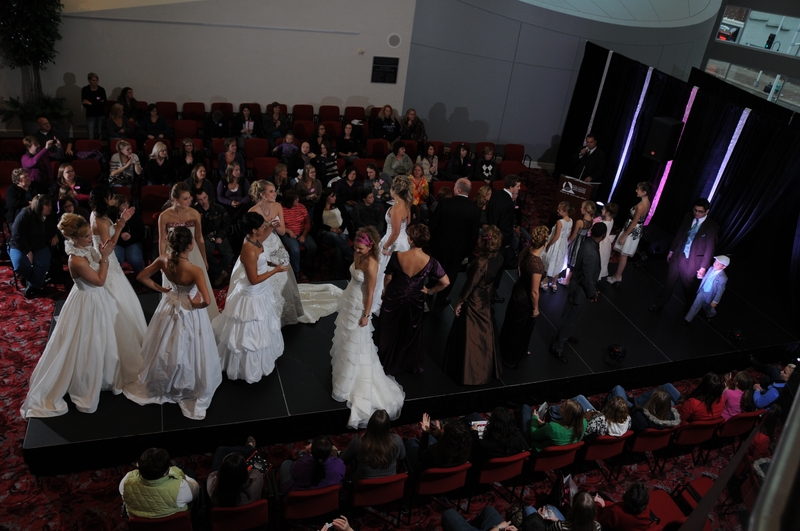 Two Spectacular Fashion Shows will be held in the Main Lobby of the Tundra Lodge and will feature 6 area bridal salons. We’ve never done a show like this so you’re in for a treat! Be there or be…Square! A special entertainment segment will get you even more excited to see the newest of bridal fashions on the runway. The first 200 brides will receive a card for a matching wedding band set and one year subscription to Brides Magazine. Hors d’oeuvres will be served throughout the day and a variety of other samples from our amazing wedding vendors. Make all of your wedding plans in one place at the Fall Wisconsin Wedding Spectacular at Tundra Lodge, Green Bay, WI. Coupons and Tickets available on line or at the door $12.00. Ladies, don’t forget the groom! He gets in FREE, plus I’m sure he would want to help with planning the wedding to the woman of his dreams!